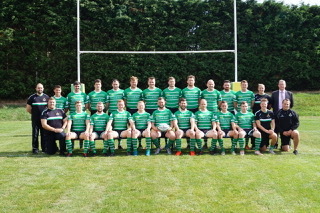 Buckingham maintained their precarious grip on second place in the Southern Counties North with an impressive 39-24 win away at Reading. The visitors picked up from the previous weeks vital win at home to Marlow as Matt Payne needed just 5 minutes to go over for the opening try. Reading responded with a fine passing move to go under the posts themselves, but Payne dived across the line for his second try, Gillie successfully converting. This was followed by a further score from Jak Cluness dotting down after a skilful kick and chase. A second conversion took the score to 19-10 at the break in Buckinghams favour. Max Nagy on as a replacement extended the lead with a well taken try earning the bonus point. Reading came back with their second score but Stuart Tomlinson claimed a well earned try himself and two scores in quick succession secured a well deserved victory. Pat Ockendon busy throughout earned the man of the match plaudits. Buckingham still hold a 3 point lead over Marlow but having played a game more and with only three fixtures to go, the race for promotion play off places looks set to go down to the wire. Without a game this weekend, Buckingham next entrain Reading Abbey while Marlow travel to bottom of the table Littlemore.